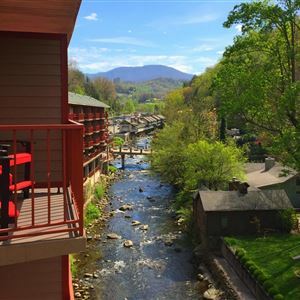 Property Location With a stay at Baymont Inn & Suites Gatlinburg On The River in Gatlinburg, you'll be minutes from Herbert Holt Park and close to Ripley's Aquarium of the Smokies. This hotel is within close proximity of Sweet Fanny Adams Theatre and Cooter's Place. Rooms Make yourself at home in one of the 67 air-conditioned rooms featuring refrigerators and microwaves. Rooms have private balconies or patios. LED televisions with satellite programming provide entertainment, while complimentary wireless Internet access keeps you connected. Bathrooms have shower/tub combinations and hair dryers. Amenities Don't miss out on the many recreational opportunities, including an indoor pool, a sauna, and a fitness center. Additional amenities at this hotel include complimentary wireless Internet access, concierge services, and an arcade/game room. Dining A complimentary buffet breakfast is included. Business, Other Amenities Featured amenities include a 24-hour business center, express check-in, and express check-out. Free self parking is available onsite. 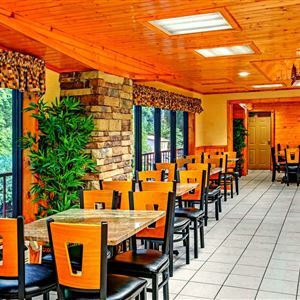 With a stay at Baymont Inn & Suites Gatlinburg On The River in Gatlinburg, you'll be minutes from Herbert Holt Park and close to Ripley's Aquarium of the Smokies. This hotel is within close proximity of Sweet Fanny Adams Theatre and Cooter's Place. Make yourself at home in one of the 67 air-conditioned rooms featuring refrigerators and microwaves. Rooms have private balconies or patios. LED televisions with satellite programming provide entertainment, while complimentary wireless Internet access keeps you connected. Bathrooms have shower/tub combinations and hair dryers. Don't miss out on the many recreational opportunities, including an indoor pool, a sauna, and a fitness center. Additional amenities at this hotel include complimentary wireless Internet access, concierge services, and an arcade/game room.